"No one can escape his fate - even were he to run more swiftly than the wind." Swedish director Victor Sj�str�m may be best known to the reasonably with film viewer due to his performance in Ingmar Bergman's Wild Strawberries, where he played the old doctor re-assessing his life. Sj�str�m was also a talented director who made more than fifty films from 1912 to 1937. 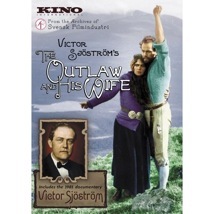 Kino on Video has released one of his Swedish films (Sj�str�m came to America in 1924 and directed several films under the name Victor Seastrom), The Outlaw and His Wife, coupled with a documentary that provides further glimpses of this talented director's work. The outlaw of the title is Kari (Sj�str�m), a mysterious drifter newly arrived at the farm of Halla (Edith Erastoff, the future Mrs Sj�str�m), a widow who has inherited her husband's land. Being of kindly nature, she agrees to give him a job, one that blossoms into a foreman's position and a romance between the two. The potential happiness is disrupted when Halla's brother-in-law Bjorn (Nils Ahr�n) learns that Kari is really Ejvind, a convicted thief who escaped from prison. Ejvind's story has more than a hint of Les Miserables in its "poor man reduced to theft to feed his family" theme and subsequent life on the run, but the film quickly turns away from that strand as Ejvind and Halla decide to go on the run together, living in the mountains, where, we are told, people can hide out indefinitely. Five years on, their life, complete with young daughter, settles into the tranquility promised earlier, until the neverending pursuit of the law closes in. The film remains a landmark film of the silent era for its use of nature and superb camerawork, shot by Julius Jaenzon, but its performances are excellent as well. The story is uncomplicated, but given more depth through the use of natural settings to mirror the movement in both the characters and the plot. The plot is fairly pessimistic in its view of the world, as the rich get richer and the poor remain under the boot of the wealthy; Halla falls when she treats her hired help as something more than chattel, but her destiny is seemingly pre-arranged, given her rise from lower class via marriage. Sooner or later she'll be knocked down where she belongs, and in the end, Bjorn gets her land once she runs off with Ejvind. Halla's farm serves as a distinct contrast to the rest of the world we see in the film, where even the church is corrupt and venal. Ejvind and Halla's mountain idyll is cleverly located on a cliff, an apt choice given the precariousness of their freedom. When that freedom is shattered by the vengeful Bjorn (humiliated by Ejvind in a wrestling match earlier in the film), the film descends into tragedy, with Halla committing a shocking act of parental protection and Ejvind committing murder in self-defense. From here, there is no going back, and when the film picks up after another sojourn of several years, the end is near. The frozen waste the characters find themselves in serves as a stark illustration of the distintegration of their lives over the intervening years, and a sobering end to their tale. Image Transfer Review: The case makes no mention of any digital restoration, and the copyright only gives a 1986 date (coupled with a cheesy VHS-era opening), so we must conclude that the transfer derives from Kino's earlier VHS release of the film. The print used is ragged and dark at times, but not unwatchable, and certainly could benefit from some cleaning up, given the choice location shooting. As such, this is nothing special in the realm of silent film releases. The intertitles have been recreated in English using the card style of the original Swedish release. Audio Transfer Review: The score by Torbjorn Iwan Lundquist provides fine accompaniment to the feature, and it sounds perfectly fine as well in Dolby 2.0. No defects to note. Extras Review: An excellent item is included here, G�sta Werner's 1981 documentary Victor Sj�str�m, which covers the director's career in just over an hour, featuring numerous clips from the director's films, as well as providing useful background information. Well worth your time. An insert essay provides further details on the director and his work. Victor Sj�str�m's tale of doomed love in the Icelandic mountains remains a powerful viewing experience, thanks to its beautiful natural settings and compelling tale. Kino's DVD could have used a better transfer, but the additional documentary on the director makes this a worthwhile package.